Even with a number of major office buildings under construction, vacancy rates went up only slightly meaning office demand remains strong. A number of major new Fifth Avenue retail leases were announced. Meanwhile, in secondary retail markets prices continue to decline as Tenants still wait for better deals. Asking Retail rents on Fifth Avenue from 42nd Street to 49th street are soaring. The area saw the strongest year-over-year growth during the third quarter, with asking rents up 14.3% to $1,244 per square foot. Landlords have started to drop asking retail rents on some of the city's priciest shopping strips such as Madison and Upper Fifth avenues. Ground-floor asking rents have fallen year-over-year on seven of the 17 Manhattan shopping corridors. In the most severe cases, such as on Madison Avenue's "Gold Coast" and the Herald Square area, average asking rents are down 6%. Over the past several months, vacancies have been on the rise in areas like the Gold Coast and Broadway in Soho, as tenants have refused to meet the record rents landlords have been asking in these prime shopping areas. On Madison Avenue between 57th and 72nd streets, asking rents dropped 6% from last fall to $1,613 per square foot. Retail on 34th Street between 5th and 7th avenues saw a similar decline to an average ask of $836 per square foot. Even Upper Fifth Avenue, which for the second year in a row was the world's most expensive shopping address, saw a slight decline of 1% down to $3,397 per square foot. Office leasing slowed in the third quarter, but asking rents continued rising in Manhattan. Total leasing volume was 21.9 million square feet through September, 10% less than the same period in 2014. Manhattan's average asking office rent rose 6.6% to $71.02 per square foot last quarter, from $66.62 a year ago. 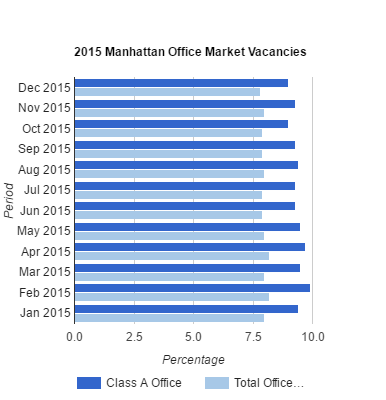 Manhattan's vacancy rate was steady at 8.9% in Q3. The Downtown office market saw leasing activity increase by 60% from the previous quarter to 1.38 million square feet but still was a 15% decrease from the third quarter of 2014. Year-to-date leasing Downtown totaled 3.39 million square feet through September, down 34% from the same period a year ago. The availability rate of 11.9% declined from 12.8% a year ago. Average asking rents dropped slightly in the latest quarter to $56.67 per square foot, but still up 12% from the same period year. Average asking office rents in Downtown remained above $50 per square foot for over a year. The Midtown South office market continued to be the tightest in the city during the third quarter with a 7.9% vacancy rate and average asking rents of $71 per square foot. Midtown South leasing activity totaled 1.5 million square feet in the third quarter, down 16% from the same period last year. Year-to-date leasing activity of 4.5 million square feet dropped 12% from the first three quarters of 2014. The Midtown office market saw leasing activity total 3.6 million square feet in the third quarter, down 9% below the five-year average for the period and a 34% decline from the second quarter. Year-to-date leasing activity of 13.7 million represented an 8% jump from the first nine months of last year. Vacancy rate of 10.5% was the lowest since late 2008. Average asking rents of $77.89 per square foot were up by 4% from the third quarter last year.